Anchor Summer is the first American wheat beer in modern times. Our first brew of this light and refreshing beer was in the summer of 1984. 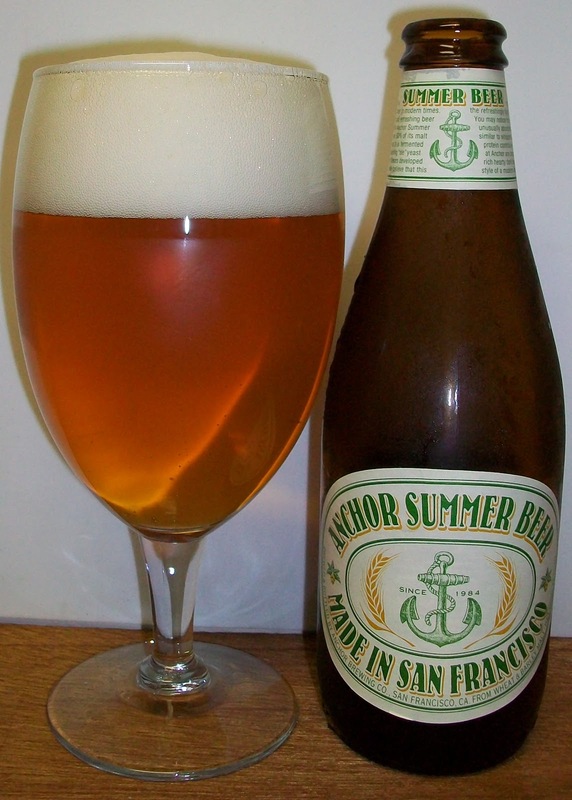 Anchor Summer is an all-malt beer, and over 50% of its malt comes from malted wheat. It is fermented with a Triticum aestivum, AKA wheat traditional top-fermenting "ale" yeast because we prefer the clean flavors developed by this yeast. We believe that this style best celebrates the refreshingly light flavor of malted wheat. You may notice that the head on this beer is unusually abundant, with a consistency similar to whipped egg whites. This is due to protein contributed by the wheat. The brewers at Anchor are proud to have revived not only rich hearty dark beers, but also this light crisp style of a modern American wheat beer. I asked my son John to pick up a few summer beers that I have not reviewed. This is one of those beers. The beer pours a clear golden yellow with a fairly rich bright white head. The nose is very pleasant with light but earthy wheat malt aromas with a touch of floral hops. This is very inviting; I can’t wait to dive into this. Hmm, that first sip was interesting. I’m not sure what I was expecting but this wasn’t it. It’s not bad, quite the opposite, it’s really good but different. It has wheat flavors but also a slight hoppy bite on the finish. The experience starts out with a touch of sweetness up font on the tip of the tongue followed by a unique effervescence over the tongue during the middle of the sip. This unique effervescence has a tingling to it with an earthiness. It seems like it is building hoppiness but it does not build into a bitterness, just an earthiness. The back-end is very easy drinking. There is a slight hesitation on the top of the swallow due to this unique earthy experience. Other than that this beer has a very easy drinking and refreshing back-end. The finish is also unique. That earthiness seems to manifest itself finally into an earthy hop bite, not really a bitterness, just a bite. The final aftertaste is of a slight lingering wheat malt flavor. All and all this was a very enjoyable beer. The unique earthiness seemed to be more distracting to me. I’m going to settle for a B on this one. I was taken back a little by the uniqueness of this beer but there was nothing wrong with it at all.